The villages of Colgate and Faygate are situated in the high weald of Sussex, some 4 miles north-east of Horsham and in the midst of St. Leonards Forest. The parish covers an area of some 2,243 hectares. In 1874 the population of the parish was recorded as 449, but by the census of 2001 this had risen to 1,119 with 336 households. It is designated as an Area of Outstanding Natural Beauty and the whole area is steeped in history. Forest Road, which runs the full width of the parish through Colgate, follows the route of a prehistoric ridgeway track which would have once connected Ashdown Forest with the coast, via the Adur valley gap. There are several sites within the parish where flint implements from the Middle Stone Age have been found, dating from around 8,000 to 4,000 BC when the Mesolithic people had local hunting sites here. These people were hunter – gatherers and were most likely the very first residents of our parish! Many possibilities exist for the origin of the Colgate village name (and none of them are connected in any way with toothpaste!) The most likely for Col is a reference to the charcoal burners and the Wealden iron industry which had flourished in the area from pre Roman times. A direct connection may even have been from Godelene de la Collegate who was recorded to live in the area in 1276, from the local Horsham tax roll of that date. The family name means 'the charcoal dweller that lives by the gate', the ‘gate’ as with Faygate, being one of the many forest gates that would have protected access through the medieval deer parks which once existed at Roughey (Roffey), Beaubush (Bewbush) and at Shelley to the north. The plentiful supply of natural ironstone, along with the timber to supply the necessary heat for both the furnace and the forge made this area ideal for ironworking; hence the many beautiful furnace and hammer ponds that now grace our forest valleys. St. Leonards Forest was a popular haunt and hiding place for smugglers during the 17th and 18th centuries. A story which was published in the London papers of 1614 reported that a fearsome serpent or dragon lived in the forest near Faygate. This tale could well have been circulated to keep strangers away from the sensitive areas of the forest which were frequented by the smugglers. The name of the Colgate public house, The Dragon, reminds us of this famous legend. Opened in 1869 it was originally called the Colgate Inn. Faygate village still boasts two public houses, The Cherry Tree, which in part dates from the 16th Century and next to the station, The Holmbush Inn. 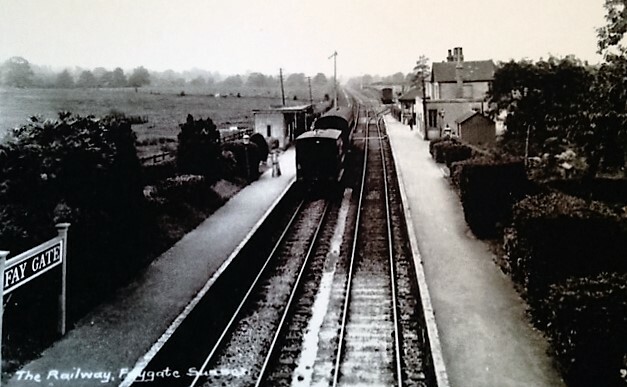 The railway station was built at Faygate as the new goods station for Rusper, when the Crawley to Horsham railway branch line was opened in 1848. 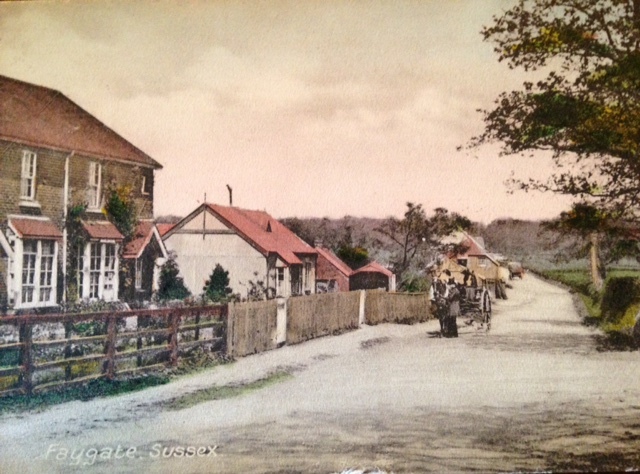 In the 19th century both villages had their own village shops and Post Offices, but the last of these to close was the Colgate shop which was converted into a private house in the 1960’s. Faygate however, still has its own garage, built on the site of the old Blacksmiths forge and also a popular roadside café, at the roundabout on the A264 Crawley to Horsham road. a builder’s merchant and many other small businesses. It is nice to think that so many of the local houses would have originally been built using bricks made from locally dug clay. In 1857 Thomas Broadwood had a tower built at the high point on which is now called Tower Road. This was a typical Victorian folly and 106 feet high, which made it some 570 feet above sea level. 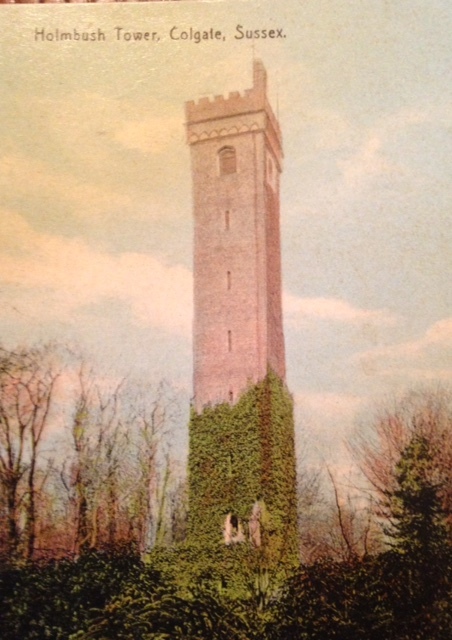 Over the years Holmbush Tower was a considerable tourist attraction for the district but after use as an observation post by the Home Guard during the Second World War and falling into disrepair it was eventually pulled down. School Group and for Bingo, Whist and many other local functions such as jumble sales. The annual village fete is also held here, which is a major community event, especially for the children. Faygate’s village hall is a fine brick building which is used by the residents for similar functions such as Bingo and Jumble sales etc. 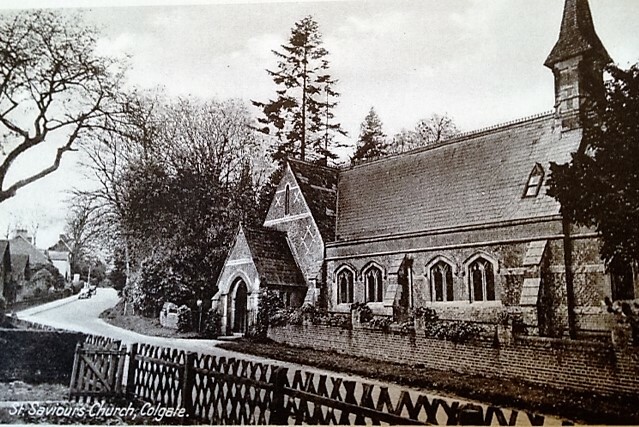 Colgate also had a Methodist Chapel built at the end of the 19th century on land between Mars Hill Villa and the present County Primary School. A Methodist Chapel was also built in Faygate and opened in 1893. This continued in use until 1966 when it was bought by the Church of England and consecrated in 1966 as the Church of St. Francis. Eventually it was sold in 1981 and converted into a private house. Even though things have changed beyond comprehension in the past centuries, especially with transport and communications, our parish still continues as a flourishing community. The one thing that continues to bind us together is our appreciation of the beautiful countryside in which we live and our desire to maintain this for future generations to come.